Chic, sleek, elegant and spacious: the Branson family-owned Riad el Fenn is an art-filled boutique luxury retreat, offering a superb combination of European creature comforts and opulent glamour—with hints of boho style. Hidden behind an anonymous door in the western parts of the medina is an exquisitely decorated, Moroccan-style sanctuary, with interiors adorned with well selected, edgy canvases from trendy artists. 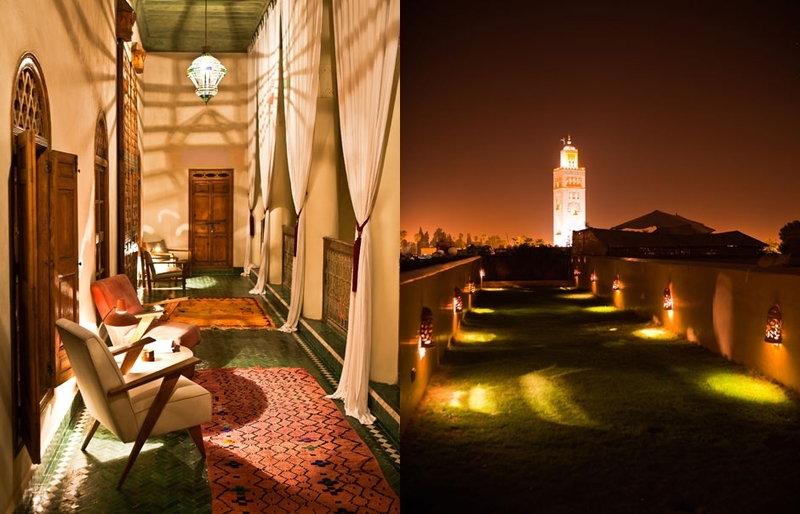 Created out of seven traditional riads, the hotel follows the traditional Morrocan riad model, with no windows on the street side and light flooding into the hotel via the central courtyard. The rooms have a sparse Moroccan décor, with rich finishes: marble floors, carved window cornices, inlaid-silver surfaces. They are individually appointed and furnished, the best featuring a private terrace and their own plunge pool. The magnificent roof terrace is the best place to pass the day. It offers a shaded area with daybeds, small heated pools, a sun deck, gardens and even a putting area with natural turf. Views are perhaps the best in town: the city roofs, the Koutoubia mosque, to the backgrop of Atlas mountains. Even the steam rising from the food stalls in the Djemaa el-fna square is visible. It’s a sight that becomes a pure magic at dusk. Equipped with a piano and stage lighting the restaurant occasionally becomes a place to enjoy live music—but the prime reason is of course the food. With the menu steered by seasonal organic local produce—sourced from Branson’s organic garden in the foothills of the Atlas mountains—the food is fresh, simple, inventive and eclectic, with focus on the modern Mediterranean taste. The el Fenn is an authentic riad, restored beautifully with great attention to detail. The interiors are full of historic charm, but are accented with modern art. Perfect choice for a twin-centered holiday with the other Branson’s retreat, in the High Atlas Mountains: the stunning Kasbah Tamadot. 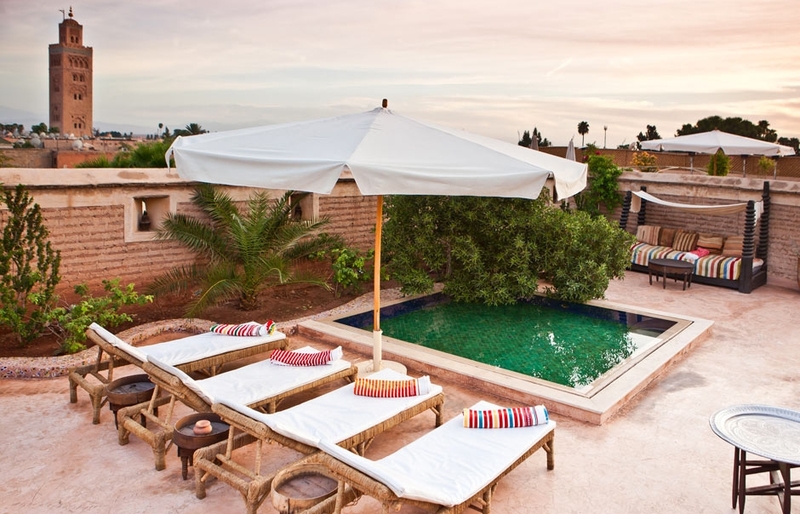 The riad is accessible to travelers with disabilities. Who stayed here? Kim Cattrall, Gwyneth Paltrow, Annie Lennox Gwen Stefani—and any creative types seeking understated style.